During Supreme drops, it’s hard not to want more than you need. In the same week, there could be multiple items that you want. You may also want to cop multiple pieces of the same thing. But with rules and regulations on copping Supreme, it’s tricky to break the rules and not get banned. Especially if you’re using a Supreme bot. So with a new Supreme season just around the corner, here are some Do’s and Don’ts to help you cop the next Supreme drop. Simply said, copping Supreme online is pretty much impossible without using a hack or a copping tool. Unless you want to fly out to a Supreme store and cop in person, you’re not gonna get lucky with this red tag brand. DO use a Supreme bot or extension. When it comes to Supreme, a stupid mistake can cost you a fortune. You cannot use the same info (both billing and shipping) to cop multiples of the same item. You just can’t. It defies all the rules and you’ll get banned. Even if you’re using a proxy. But on the bright side, you can use that same information to checkout a whole other item, and that’ll be fine! Phew. DON’T purchase 2 same items with the same info. DO purchase 2 different items with the same info. Similar to the billing and shipping information, you’re going to need to be careful when it comes to your payment methods. You don’t want to seem suspicious! 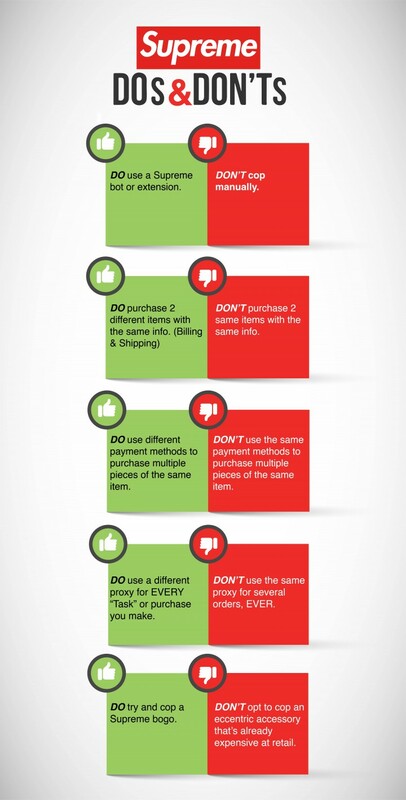 DO use different payment methods to purchase multiple pieces of the same item. Out of all the advice you could ever get, this one is probably the most important! You need to have Supreme proxies on your hand for every order you make if you want to make several orders, especially if you’re using a Supreme bot. There’s absolutely no way to cop with a Supreme bot without having Supreme proxies. DO use a different proxy for EVERY “Task” or purchase you make. DON’T use the same proxy for several orders, EVER. Some advice for copping Supreme items is to remember that there are some people out there who just want to own something that’s Supremeabranded, no matter what it is. These people will search for Supreme with the “Price Low to High” filter. If you cop a cheap Supreme tee, you can still make a lot of money with the price premium, since the resale price will be low in comparison to someone who buys a more expensive Supreme item. In other words, if you buy an item for $20, you can sell it for $50 and make $30 profit. Whereas if you cop a $50 tee, you’ll have to resell it for $80 to make the same profit. People would automatically go for the cheaper tee. DO try and cop a Supreme bogo or a very cheap Supreme shirt. DON’T opt to cop an eccentric accessory that’s already expensive at retail.